The Myrtleford & District Historical Society Incorporated has numerous Products of Historical Value for Sale. These books are recollections of early life in Myrtleford and surrounding areas, as discussed with the Society. As such, they provide useful historical information on most of the settler families in this area. Rie Arundel, Cavedon, Shirley Chambers, Millie Crameri, Cundy, Margaret Dean & Audrey Wallace' Al Jarvis, Daisy Lewis, Ora Long, Phyllis Lowcock, Joyce Lowerson, Norman McGeehan, Jean McLees, Grace Maguire, Nan & Bill Moore, Beryl Melbourne, Dino & Mary Piazzo, Jim Piazzo, Rayner & Lowerson, Elsa & Mario Rinaldi, Robertson, Phyllis Watson & Harold Clancy and Elise Weston. Additional volumes, 2--4, have taken the total number of families recorded to 80. 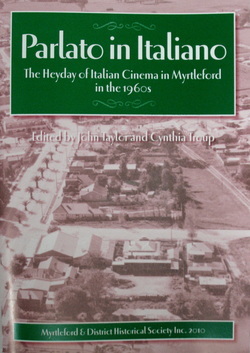 A story of the heyday of Italian cinema in Myrtleford in 1960s. Movies were shown in the old picture theatre, in the Memorial Hall. These are prepared by local Myrtleford identity, Mr Tiff Rayner. Available years are 2000 - 2013. Each calendar has 12 historical photographs from the Myrtleford area.